Welcome back to another edition of Web Animation Watch, where we feature the best in online animation new, and not so new. This time: space tourists, super-villains, Demon Hunters, Dragons and more! Meet Glenda- a harmless looking pink-haired space tourist. In this hilarious first episode, Glenda has fun with a mysterious portal, apparently completely oblivious to the warning signs nearby. Without a word of dialogue, this is a masterclass in visual comedy. Created by Someone's Ex. Visit the Glenda YouTube channel to see every episode so far, plus extras (that are as funny as the series itself). You can support the creator via Patreon. In the last edition of WAW, we introduced you to Rocket Adrift Cartoons self-titled series. They are responsible for a lot more than that, however- like the ace Catra From HR, which (so far) consists of 10 episodes. The ingenious premise is this: an 80's cartoon villainess (originally from She-Ra) is magically transported to Earth, where she finds a new calling.. in human resources. The art style is spot-on, but most of all we love the pitch-perfect intro sequence. Watch the rest on their YouTube channel You can also support the animators on Patreon. From Mondo Media and Solis Animation is this new series about a reluctant 45-year-old demon hunter. All he wants is to retire from the Demon Ministry, if only they could find a new chosen one to replace him. It's a fun mix of supernatural shenanigans and mundane office life. The first episode is available on YouTube, but US viewers can watch the whole series streaming on VRV, Contains strong language and violence. It may be inspired by the Webcomic Windy Lightning, but you won't need to be familiar with the source material to enjoy this. Created at the animation department of Tokyo Design Academy, this is a slice of anime-style loveliness that will leave you wanting to find out more. Directed by Mar Exposito- who also created the comic itself. 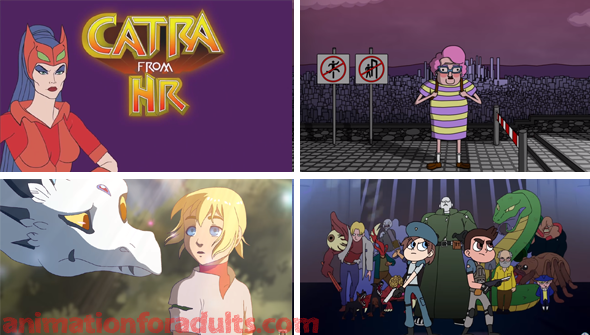 Mashed are back with another of their inspired mash-ups- this time crossing Daron Nefcy's Star Vs The Forces Of Evil and the iconic video game franchise Resident Evil. It's the kind of crossover you never knew you needed. Animated by 4Taken, from a Concept, Lyrics and storyboards by Jamie Spicer-Lewis.